My grandfather grew potatoes. 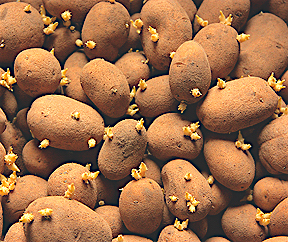 The process looks like this: take a potato; let it sprout in multiple places: the little sprouts are called eyes. Cut the potato it into 7 or 8 pieces so that each chunk of potato has an eye on it; plant the chunk of potato in the ground; water and care for the potato and pretty soon it shoots above ground with no visible signs of any real growth, other than a useless leafy surface plant. Underground, the eye uses the attached chunk of potato for food and starts growing; then it sprouts roots and begins pulling nutrients from its surroundings. For grandpa, later in the year that he would take his pitchfork, gently dig around the potatoes and harvest them. The huge edible potatoes were under ground, hidden from sight. Then, after harvest, the process starts all over again. We need to lead by potato. Let’s take our leadership, split it into 7 or 8 chunks and then discriminatingly plant these leadership chunks in various individuals that are good soil. We need to make certain that the chunk of leadership has our eye—our vision, purpose, direction, worldview—and we need to be sure we give that eye enough of ourselves to nourish it until it can grow roots of its own to begin feeding itself within its own surroundings. After it is planted, we need to keep up with that chunk of leadership: we need to water it and pull the weed away that would starve it. We need to remember that for a season, our leadership grows deep in individuals in ways we cannot see—under the soil: for a season, all we may see is the less-than-glorious green, leafy part. And, finally, when it’s time, we need to gently dig around our new leaders, loosen them from their surroundings and get them to market where they can nourish individuals or become seed for other new leaders. The DNA of every potato is the same: start as the eye of another potato; live off the deposit of its predecessor; grow value under the surface as it is watered and tended; shoot up with visible parts that are nice but not the food; grow larger useful subterranean parts that are edible and reproducible; and ultimately be enjoyed by others, become seed for new potatoes or perhaps some of both.